Beautiful Rainbow Moonstone and mica tinted polymer clay completely hand sculpted. 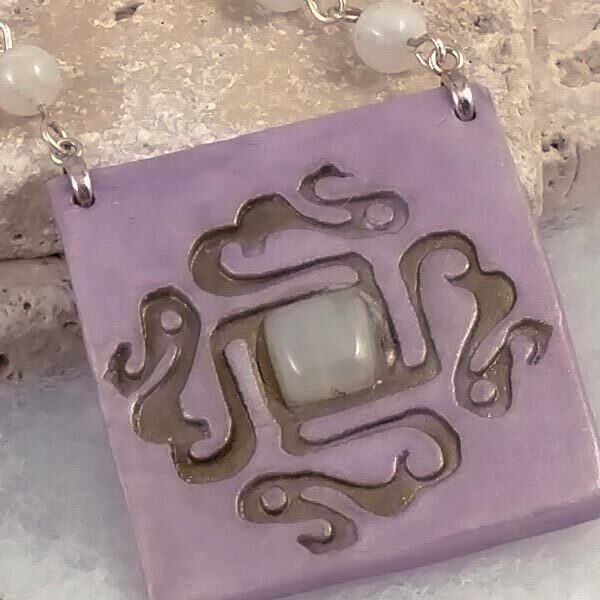 Created in pale lavender colors with a Rainbow Moonstone surrounded by gold tinted vine patterns. Beads are individually linked Amethyst and Rainbow Moonstone with fine pewter spiral accents. Carnelian promotes nurturing of self and others, provides the ability to change and helps to establish healthy boundaries. 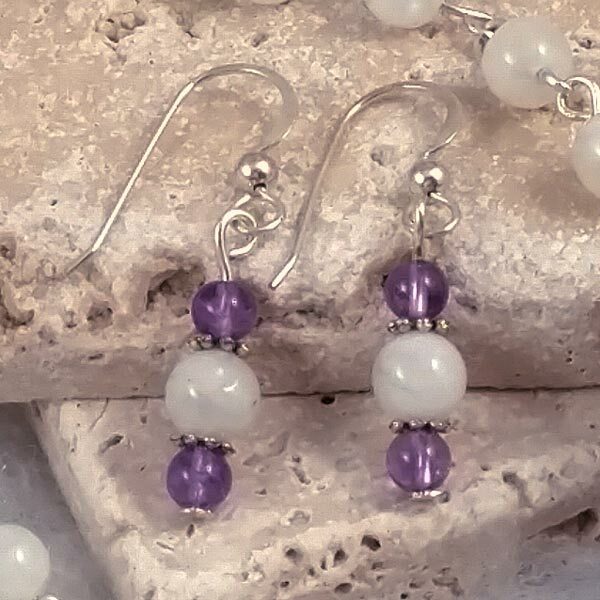 Matching Rainbow Moonstone & Amethyst earrings (sterling ear wires) and gift box included. 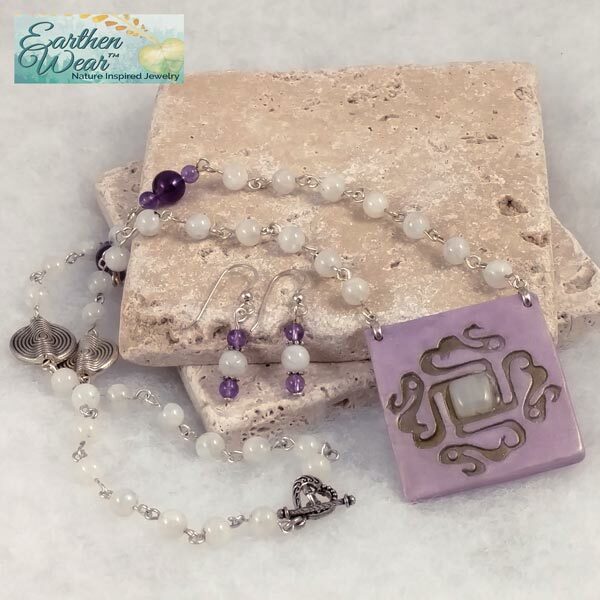 Pendant is 1-1/2 inches square, beaded chain is 21 inch length. Supports a connection to the Goddess and the moon. Regulates menstrual, fertility cycles and menopause. Enhances psychic knowing, psychic insight, and entering into realities other than those which are earth based. Increases intuition, advances ancient women's wisdom, helps in developing magick, and aids in rituals. Soothes the emotions and mind, aids spiritual growth and development, and helps to heal the astral body. Rainbow Moonstone has a monoclinic crystal system and is in the mineral class of lattice silicate in the feldspar family. While Moonstone in general occurs in several varying shades and colors, the Rainbow Moonstone is generally white, to almost clear at times, and usually has a bluish shimmer to it. This color effect is due to its inner structure being a laminate of feldspar which bends light, the same effect as the flash that comes from Labradorite. In this one though, it is potassium that provides the shimmering blue color effect. While I can not say it has been scientifically proven, I had read a long time ago that its coloring would deepen and become more brilliant when the moon was full. I have watched many of my pieces over the years and I have to say that some, but not all, definitely seem to have a much deeper blue coloring at the time of the full moon, and they also seem to acquire increased energies as well when this occurs. My daughter has also noticed this in one ring that she wears, and others have mentioned observing the same effect in pieces that they have acquired. For spiritual purposes, meditate with a piece on your forehead. For emotional experiences it would be placed over the heart. This is one that can be worn or carried all the time and continues to provide what is needed at any given moment. Rainbow Moonstone can encourage lucid dreaming, especially while the moon is full. It is also an aid to the cycles of our spiritual growth. In coming to the end of a lesson, there is no sadness, only joy, for we have achieved the purpose, or learning of the lesson. And with each ending comes a new beginning, and so the cycle of spiritual growth continues. Rainbow Moonstone aids our subconscious in enhancing intuition which provides us an understanding brought about by 'feeling' rather than an intellectual process. After we have the 'light bulb turn on' so to speak, it also assists us in applying that 'knowing' in a practical manner. In this way we are able to make a decision rather painlessly which furthers us along our path of growth. It is also a tremendous aid in alleviating emotional tension in men or women, but is especially valuable for women who suffer from PMS or are living through their change of life. Rainbow Moonstone allows us to be open to what would seem to be an irrational impulse and enjoy the happy coincidence. But, caution should also be used because it can just as easily trip us up on our own illusions at times and get us into trouble. If in doubt, rely on the spiritual side of things and the 'knowing' that comes from that to stay on track. Moonstone can stimulate our body's natural properties of rejuvenation and can eliminate degenerative conditions associated with the skin, hair, eyes and fleshy organs of the body. It stimulates the functioning of the pineal gland (which is sensitive to light) and brings about an internal balance of hormone cycles with nature's rhythms. And yes, this applies to men and women alike. It will also enhance a woman's fertility, it will help with menstrual problems, and bring things back into balance after childbirth or during menopause. It has also been used as an aid to enhance how we assimilate nutrients and to aid in the elimination of toxins, especially in treating disorders of the digestive tract. 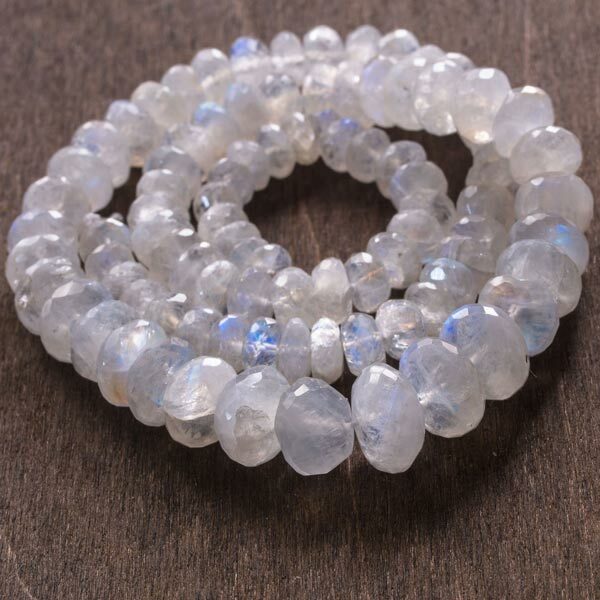 Rainbow Moonstone has special affinities with those who are in the signs of Cancer, Libra and Scorpio, but it is also very beneficial to all other signs. It carries a Receptive Energy, its Planet is the Moon, and its Element is Water. Rainbow Moonstone has been connected with the Moon, its rituals and dedicated to Moon goddesses for countless centuries. Ritual jewelry is often created with silver and Moonstone, and many a lunar wand has been fashioned with Moonstone at one end and a Quartz point at the other. A common ritual to draw love into your life is one done on a full moon by setting five to seven Moonstones in a circle and placing a pink candle in its center. After lighting the candle, sit and visualize yourself in a loving relationship. Moonstone has also been a favorite to work out problems between lovers, given to those who will be traveling for protection, and laid upon Tarot cards to increase the users psychic abilities during their use. If you are starting a new garden, bury a piece in your new plot and visualize your new garden bursting with fertility. If you have a fruit tree not producing as it should, tying or attaching a piece to one of its limbs will encourage the tree to provide an abundance of fruit for you.